How do I start feeding my dog raw? I like to tell people who want to know where to begin feeding there dog a RAW diet to start small and build slowly. I started out by adding just a little of Stella & Chewy’s frozen raw patties to my dogs kibble. 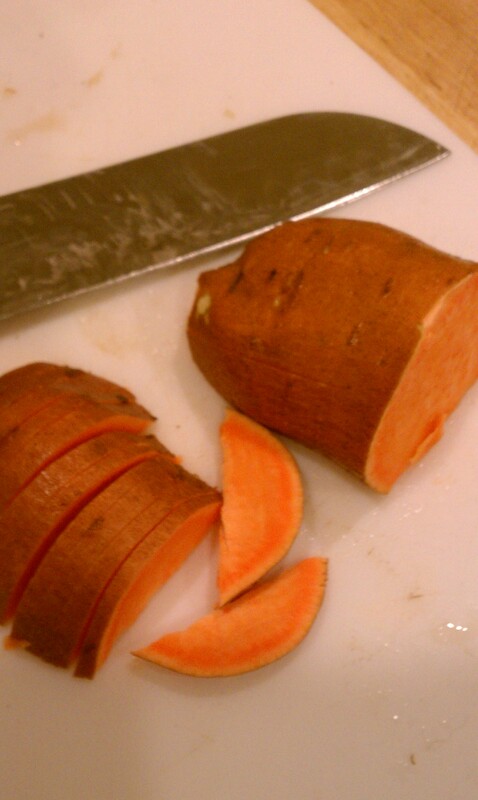 I began by adding about a quarter patty to Zuke and Nakia’s food for about a week or two then slowly built from there. Eventually I got to the point where I would feed them kibble 5 days a week, fast them on the 6th day and feed strictly the RAW patties on the 7th day. I then started increasing the number of RAW days. 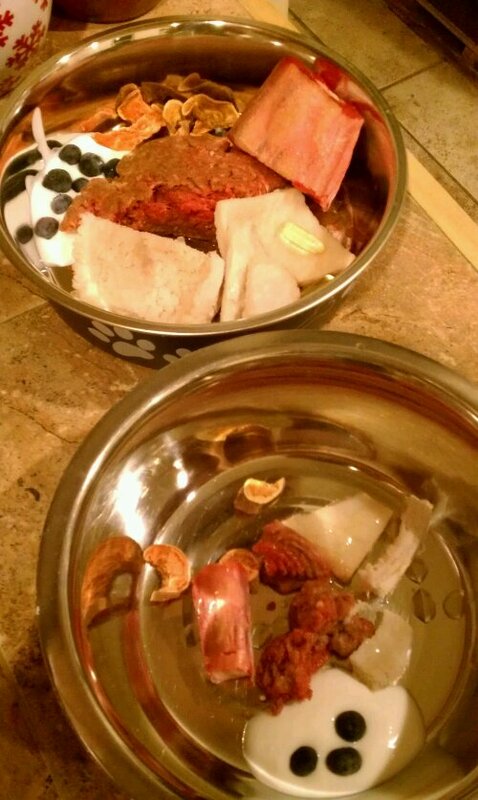 Feeding a pre-made raw food like Stella and Chewy’s is an easy and convenient way to feed RAW. 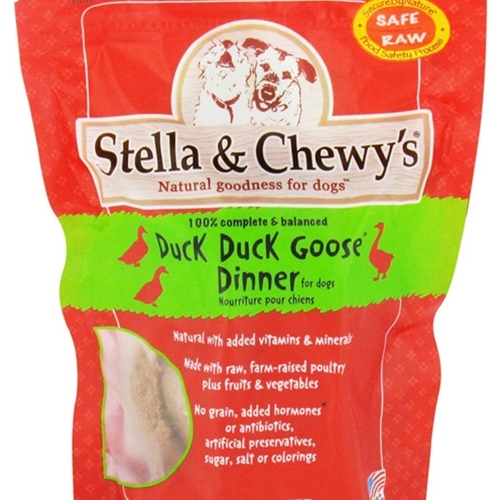 My dogs loved Stella and Chewy’s but it got pretty expensive for me. 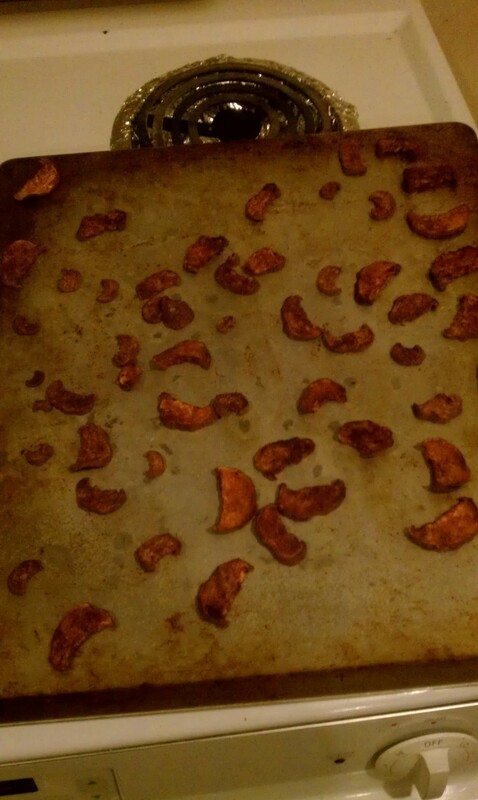 Plus, I could not stand the smell. It was torture for me every time I had to prepare their meals. I am glad I switched because I really enjoy putting together the components of their meals myself, I find it more rewarding. If you are interested in taking the already prepared RAW approach, I suggest Stella & Chewy’s. Plus, they also make RAW food for your cat. When I say, “just start out simple” I mean to add things gradually. Don’t go all out right at the beginning. Of course, if you have done your research and want to start out big, feel free. For the average beginner though, start with something simple. 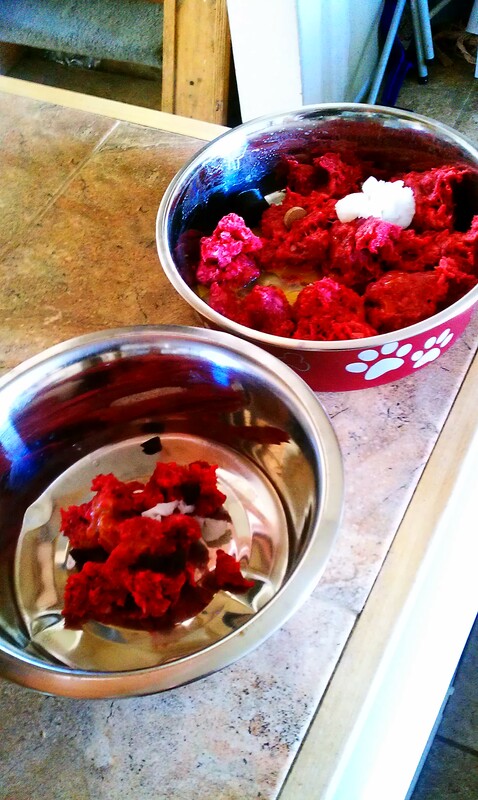 Start adding pieces of raw chicken pieces or a little bit of ground beef on top of their kibble. Great source of Omega-3 for your dog. Only $5.99 from Costco! I also suggest starting out with fish oil. 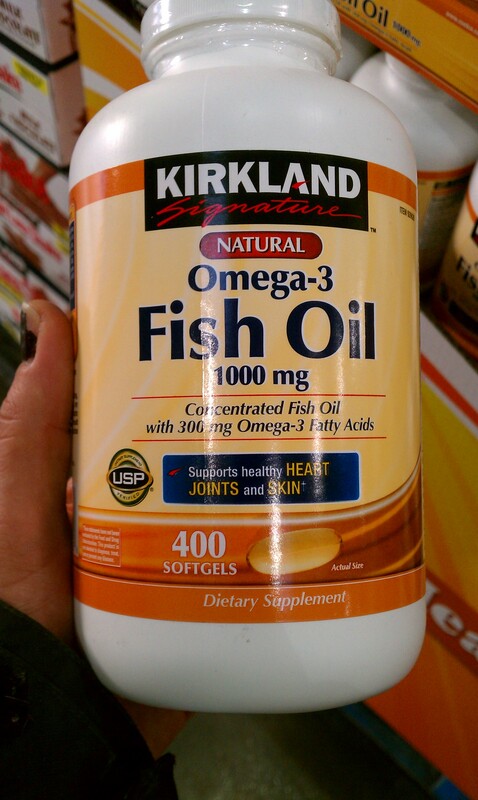 I love the capsules of fish oil from Costco. It’s only $5.99 for 400 soft gels. 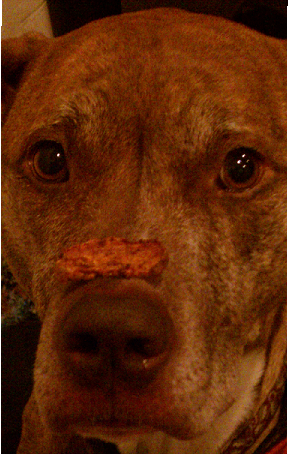 Most dogs will just gobble them up with the rest of their food. I give Nakia 2 capsules at night with dinner and cut open 2 capsules and drizzle over Rosalie’s food. I have been told that Alaskan Naturals Wild Salmon Oil (currently $25.89 for a 32 oz bottle on Amazon) is a winner but I have not tried it myself. It comes in a pump bottle and is much more convenient for dogs like Rose who can not eat the capsules. I don’t mind the extra work of cutting open the capsules though so I prefer to go with the cheaper option. 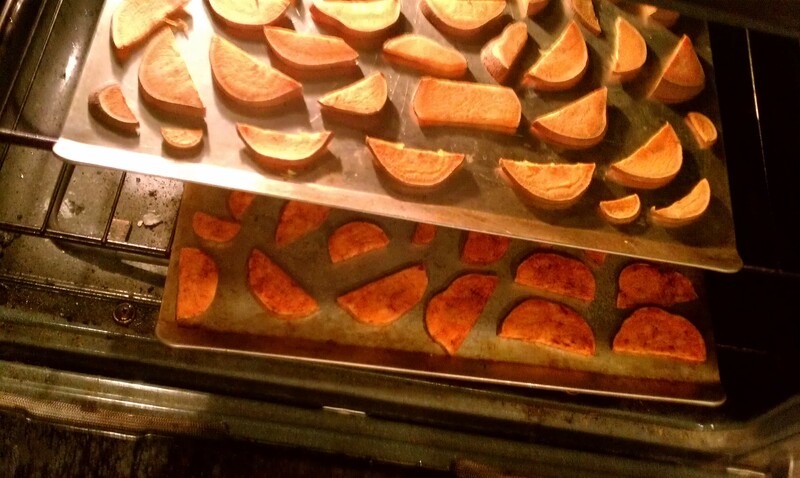 Slowly work up to larger portions. 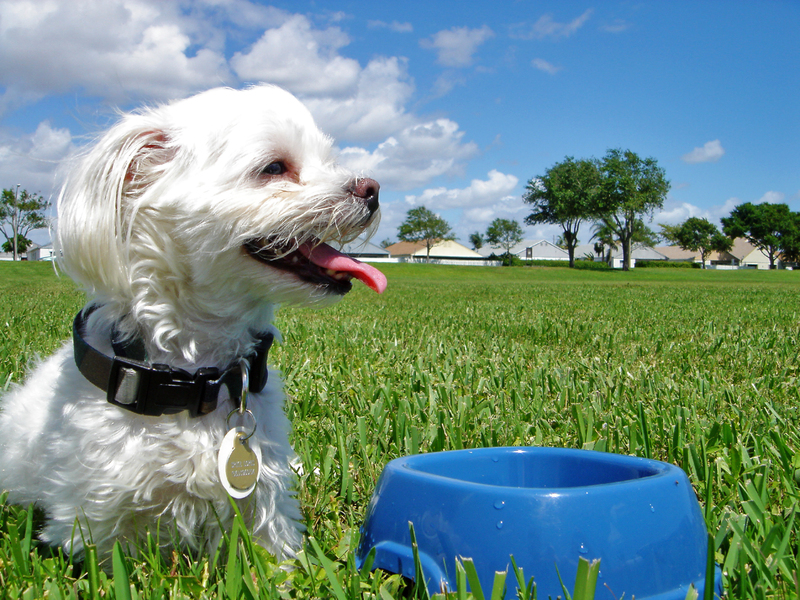 Your dog’s stomach pH needs time to adjust to the change in diet. It is best to start with bland, easy to digest foods, like chicken. Worry about vegetables and organ meat later. Don’t get too crazy at first with protein sources either. Let your dog get used to it. I like to tell people to start with raw bones too. 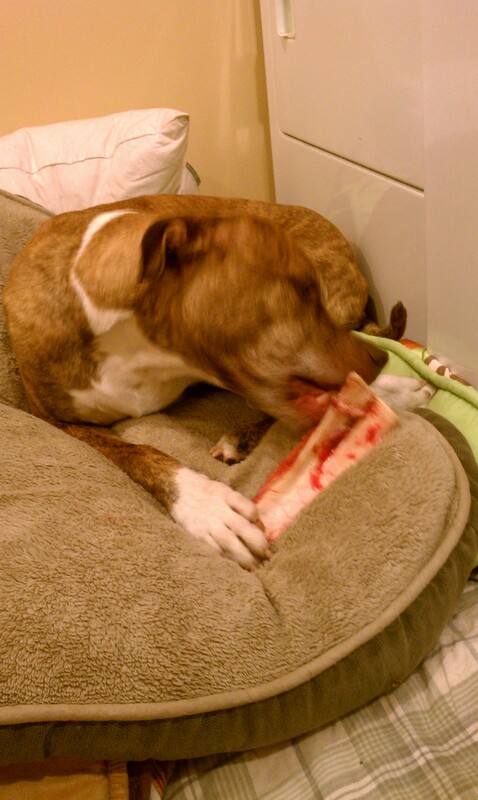 You can find raw beef marrow bones at your local butcher. 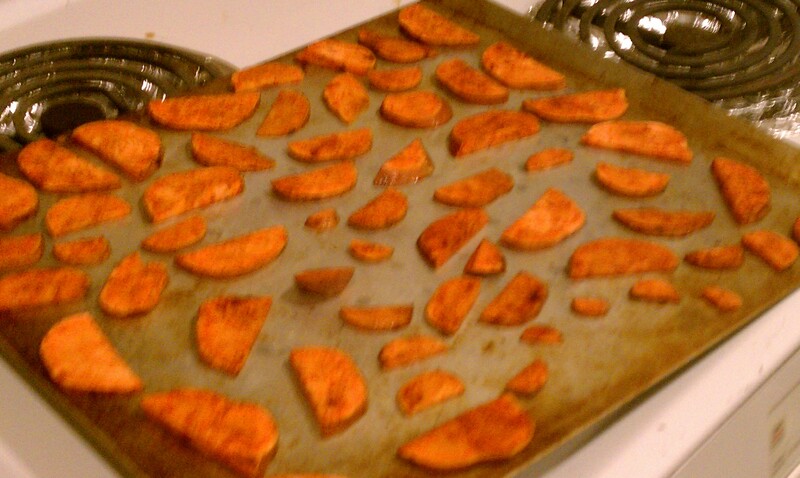 They will usually cut them into smaller pieces for you. You may find as you are building up to more and more RAW meals that your dog begins to refuse to eat his or her normal kibble. He or she now knows there is a better option. 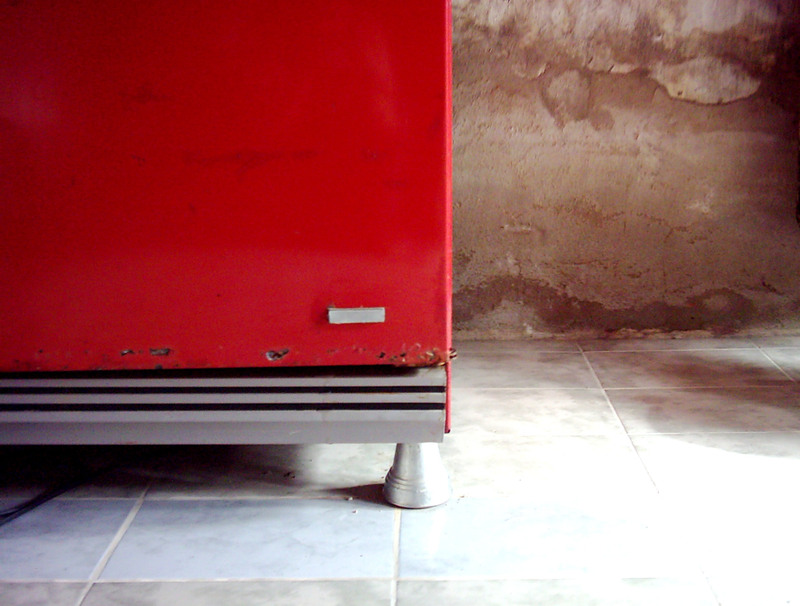 Don’t worry, your dog is not going to let itself starve to death. However, if your dog goes a few days without eating at all, see your Vet asap. It could be a sign of something more serious. 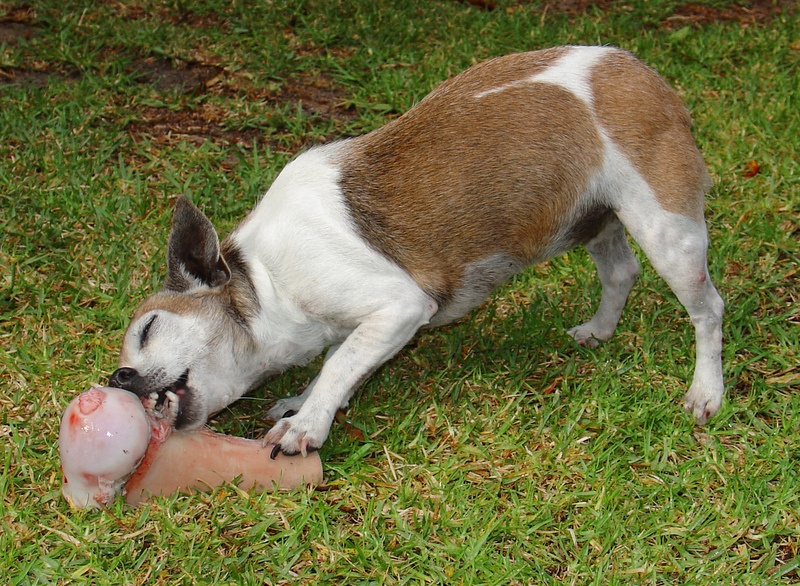 Some people start feeding their dogs RAW using what is known as the cold turkey method. With this method, you stop feeding kibble immediately start feeding all RAW. Of course, your dog will most likely have an upset stomach and the runs for the first little bit. I personally did not want to cause my dogs the stomach upset so I used the slow method. Keep in mind while most dogs do really well on RAW it is not necessarily for every dog. If your dog just doesn’t seem to enjoy it or suffers from lots of tummy upset it just may not be for him. 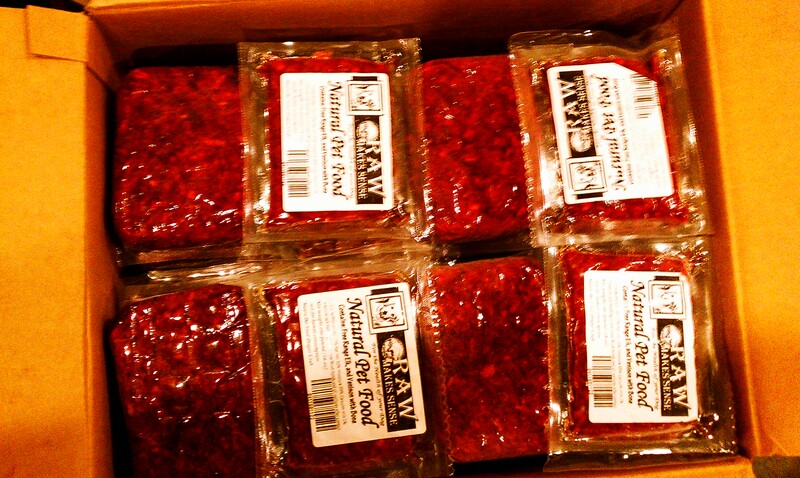 The search for more cost effective ingredients and a bag of guts. 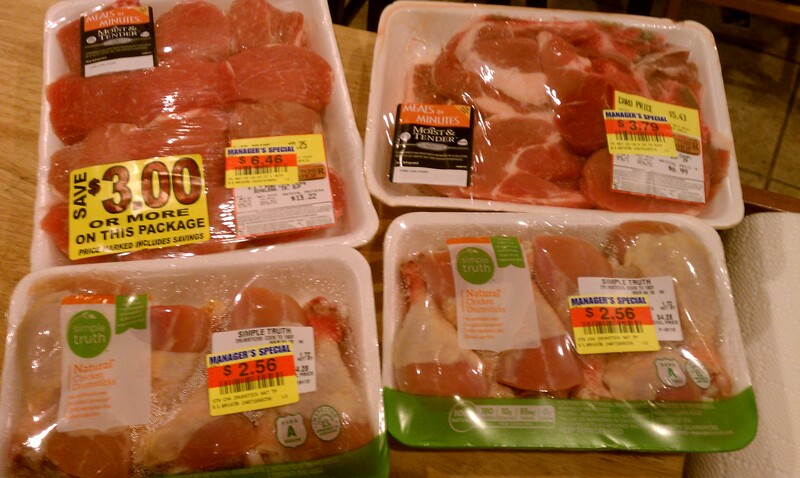 I am always on the look out for places to buy cheaper, good quality meats. Yesterday my friend Ali and I stopped by a local Mexican market, Rancho Market. I failed to take pictures unfortunately, not realizing until I got home that I should have. The selection at the butcher was amazing. They had so many different animal parts. Chicken and pork feet, tripe, cornish game hen, the butcher’s counter just went on and on. 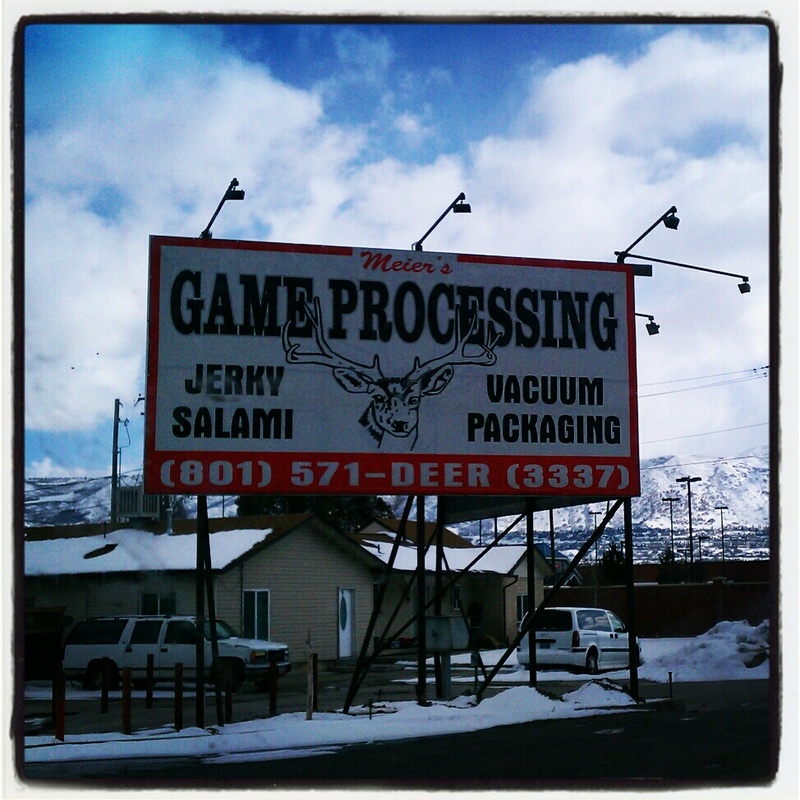 They guys behind the counter were super helpful and eager to get us whatever we needed. I ordered 2 cornish game hens, 2 pounds of cut up tripe, 3 pounds of ground beef, and a package of ox tails, which weighed about a pound and a half. Each of these came in a pretty pink bag. I am very excited to go back to try many of the other meats. That night I gave Nakia and Rose an assortment of goodies. I fed them some ground beef that I had previously defrosted. I didn’t want to give them the ground beef I just bought because I want to freeze that beef for three weeks to rid it of any parasites or bacteria that might make the dogs sick. I gave them each a bit of the tripe. I wanted to see how they liked it. Tripe is considered an organ or offal and as you know Rose hasn’t liked the previous organ, liver, so I wanted to see who she would do with the tripe. I have to say, I had a really hard time handling the tripe. One thing that feeding my dogs RAW has done for me, is to help me get over my squeamishness concerning meat. Tripe is the stomach of a cow, or other hoofed animal. Most tripe that you get from your local grocery store has been processed and bleached white giving it little to no nutritional value for your dog. In the bleaching process the tripe is drained of its natural enzymes which are what make it such a great food for your pooch. My tripe was no exception. Although I didn’t realize I had bought the bleached kind until I did a little more research. What you actual want is green tripe. 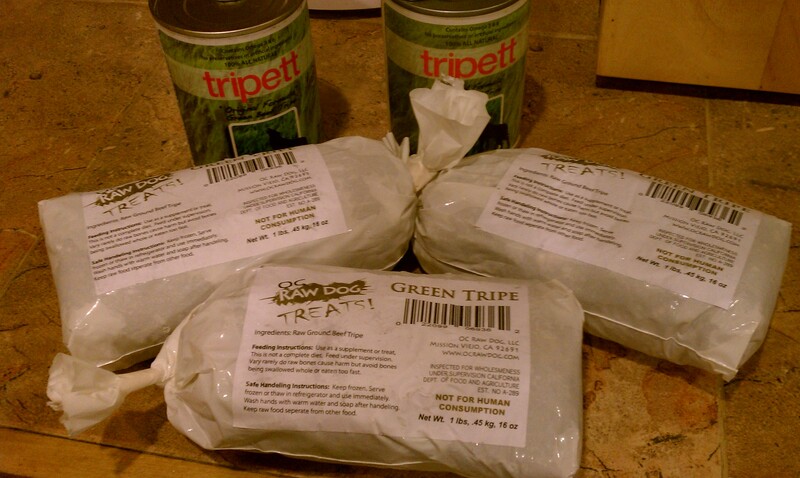 After yet more research and several calls, I discovered that The Dog’s Meow carries canned green tripe and just started carrying a frozen form. 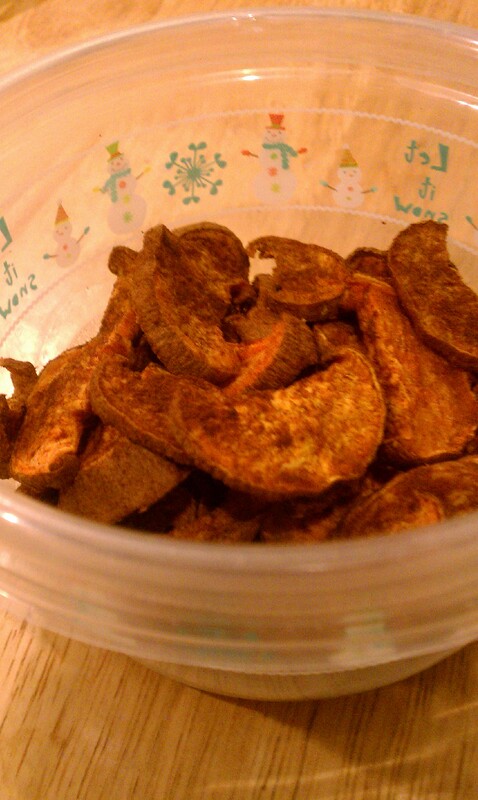 So, I fed my dogs the junk food version of tripe, but they still loved it! Of course, who doesn’t love junk food, secretly or not? I added some of the ox tail to the girls’ dinner as well. When I put their dishes down it was like nothing else in their bowls existed. They went straight for the ox tail and each retreated to their own corner of the house to gnaw on it. 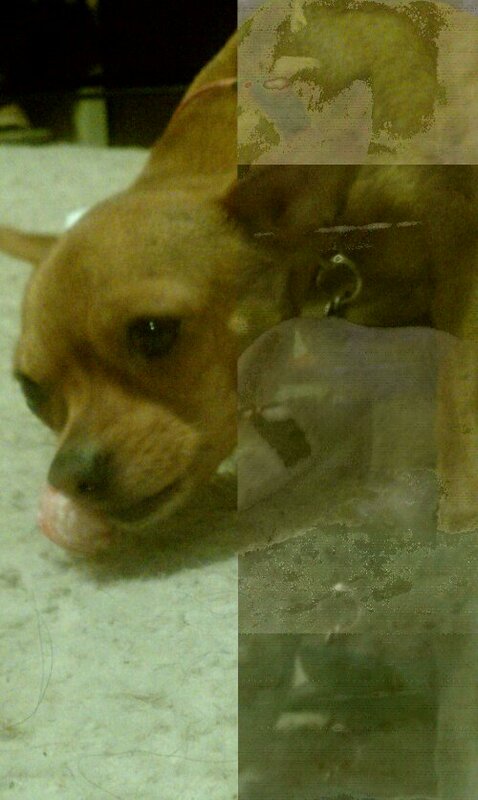 Raw bones are already like crack for them but a bone surrounded by a large portion of meat? 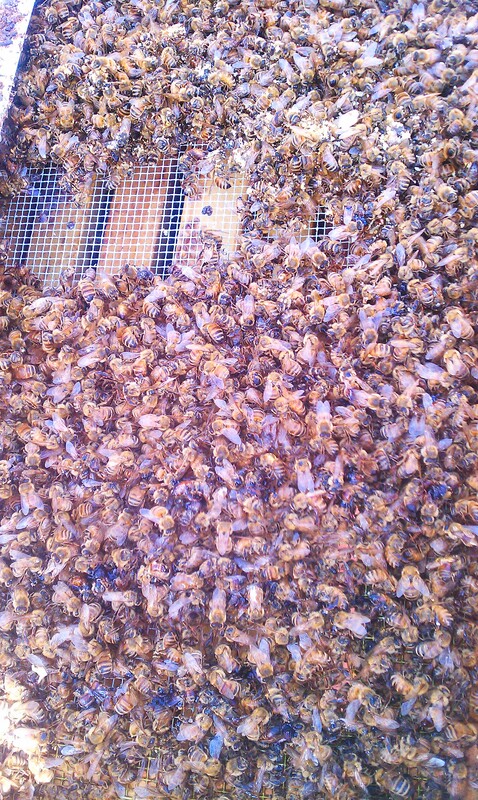 They were in heaven! After munching on the ox tails they went back and gobbled up the remaining contents of their bowls. Then, this morning I gave Nakia what I have seen on discussion forums referred to as the TV dinner of raw feeding, a Cornish game hen. Being my first time feeding anything of this sort, I just cut open the package and plopped it in her dish. 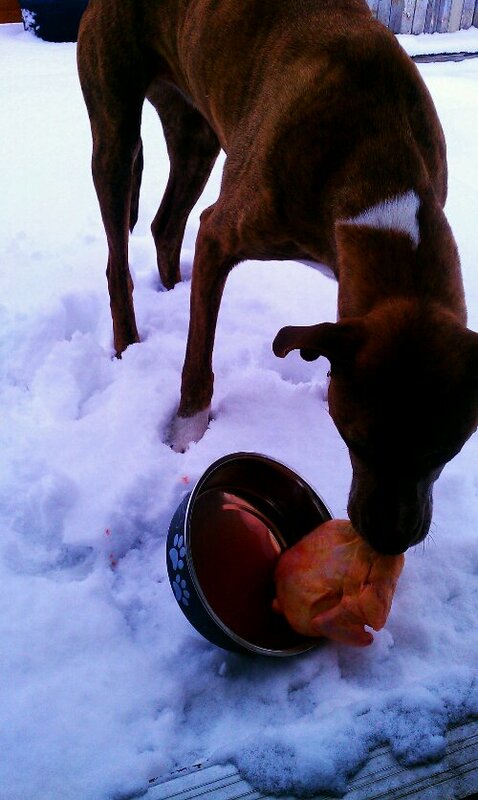 Worried about sanitation, I put her bowl outside regardless of the big snow flakes falling to the ground. I left her to figure it out on her own, while I went in to feed Rose. When I came back out the bird was gone an Nakia was happily licking her lips. As the day went on Nakia seemed especially proud of herself. Later though, I walked into the living room to a pile of throw up. As I looked at the mess I realized there was a plastic bag filled with hen random hen parts in the pile of bile. Being my first experience with a whole store bought bird, I did not know they stuffed this inside…I bet some of you are cracking up and shaking your heads. Live and learn. Oh, the adventures of RAW. Poor Nakia. When feeding my dog RAW, how much do I feed and what proportions? So, I’m getting a lot of questions along the lines of “how much do I feed?”. Well, personally I just kind of eye it for my pups. If they start to gain weight I know I’m probably feeding too much and if they look like they’re getting skinny, I cut back. If Nakia goes on a hard hike with me I’ll often give her a little extra, if she was having a lazy day on the couch a little less. Same for Rose. I just kinda “feel” it. I know that’s not really the answer you guys want though so here is what I have for you all. If your dog is active or is under weight multiply his weight by .02 – .03. You can even go up to .05 if they are really under weight or the .03 just isn’t cutting it. If they are over weight or not very active multiply their weight by .017 – .02. This works out to be about 2%-3% of an under weight or active dog’s body weight or 1.7%-2% of an overweight or non active dog’s body weight. Puppies should be fed approximately 2%-3% of their expected adult body weight. If you don’t know what body weight your pup is expected to be, feed her 9%-10% of their current body weight and adjust as needed. Basically just pay attention to your dog. If your dog is over weight, feed them 2%-3% of their target body weight. If you feed them 2%-3% of their current body weight most likely they won’t lose any weight. 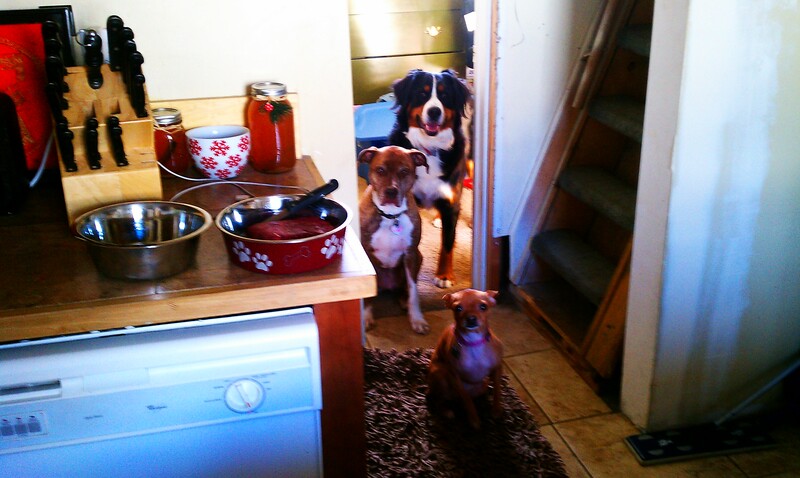 Rose, Nakia and their friend Lola waiting patiently for me to prepare breakfast. To find how many calories per day your dog needs, take their ideal weight and divide it by 2.2. 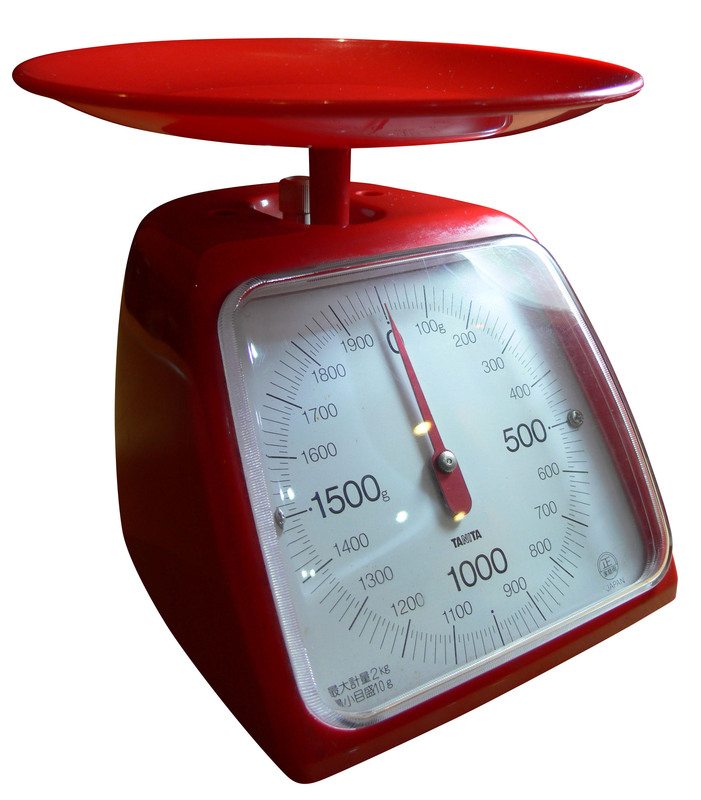 This is how many kilograms your dog weighs. Take the number of kilograms and multiply that number by 30. Then take that number and add 70. This is the number of calories your dog should have per day. It is their resting energy rate. In other words, their caloric need if they are just chilling around the house all day. 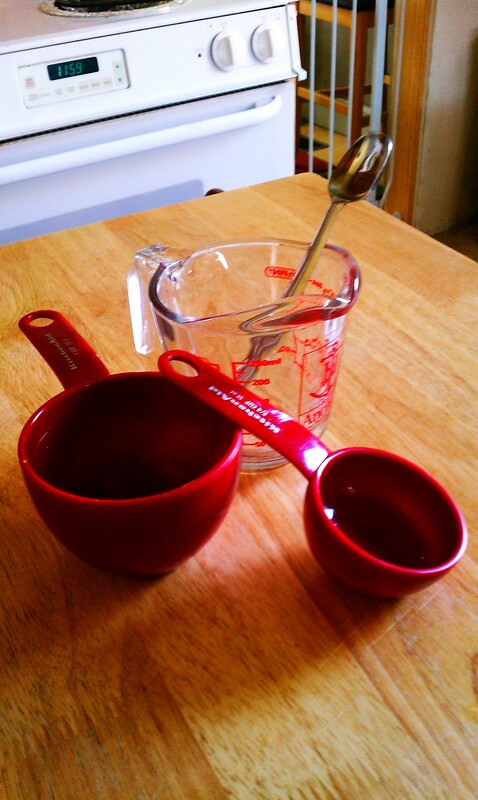 Someday I will buy a scale for my kitchen so that I can feed my dogs the correct portions. Until then as I mentioned earlier, I use what is known as the hand and eye method. Basically, I just eye out how much I think they should eat. I am a dog walker and take Nakia on long pack hikes with me. On these days I will feed her a little more than usual. If we are just sitting around the house on a lazy Sunday I will feed the pups a little less. They are both at healthy weights so my system seems to be working for us. 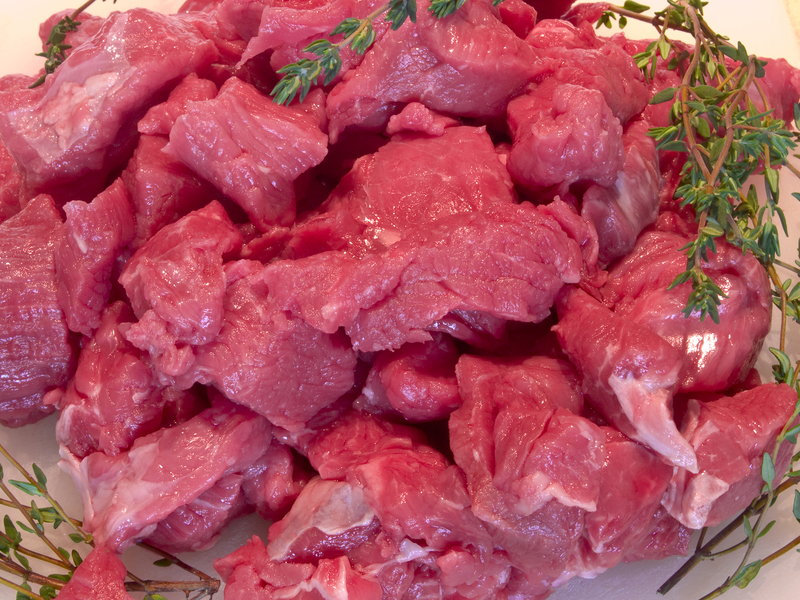 The general ratio for RAW feeding is 80% meat, 10% bone and 10% offal or organs. Where the general ratio for BARF feeding is 70% meat, 10% bones, 10% vegetables and fruits, 10% organ. I follow more of the BARF model because I try to emulate the nutrients they would get in the wild from their prey’s stomach matter. As you start getting into the swing of things with your dog you can adjust these ratio according to your dogs needs. Pay attention to your dog. You know when something isn’t right with him. The 80:10:10 or 70:10:10:10 ratio does not need to be met every day. 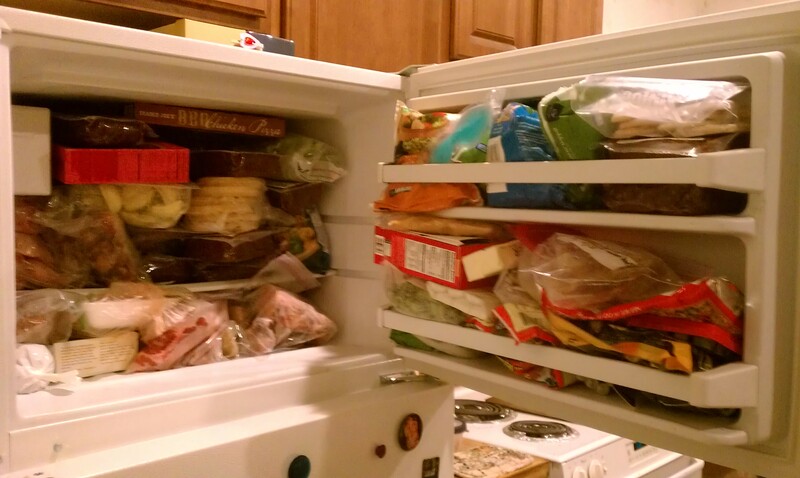 You can achieve this total ratio over several weeks. I know some people who feed their dogs offal only once or twice a month to reach their offal ratio goal. 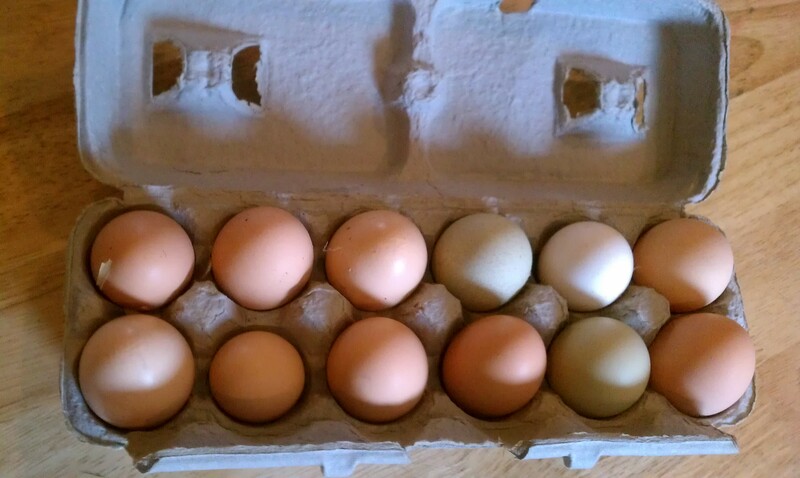 Rose and Nakia’s breakfast this morning. I feed my dog’s twice a day. 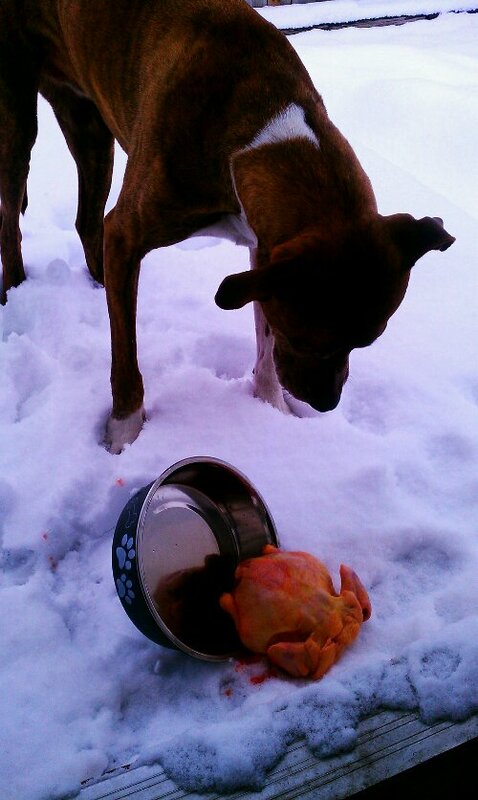 Nakia and my old dog Zuke use to eat once a day but with the addition of Rosalie I added the second feeding. I have been told it can be dangerous for small dogs to go too long without food and I felt so bad that Nakia had to watch Rose eat and didn’t get any herself. I know, I’m a sucker. I will discuss my findings on why you shouldn’t let a little dog go very long without eating in another post to come. I realize this probably leaves many other questions unanswered like, “how much fish oil do I give my dog?” or “how many eggs do I feed her?”. I hope to answer all of these questions in the not too distant future. So stay tuned for more! “We are certainly much more than what we eat, but what we eat can nevertheless help us to be much more than what we are”. 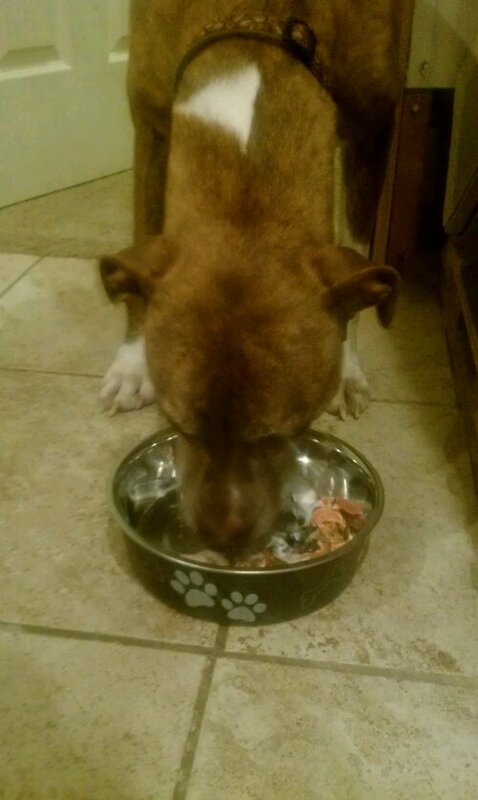 Before I began feeding RAW I struggled with finding a food that Nakia would happily eat. I struggled with her weight and people often thought I was starving her. The vet would give me lots of ideas to help her eat more; put water on her food, mix in wet food, sprinkle in some cheese, etc but none of it seemed to work. She just wouldn’t eat the kibble. She also suffered from allergies and a new health problem what seemed like every week. Commercial dog foods often contain grain or some other filler which dogs have no use for. So you are often paying for parts of a product that your dog will never use…thus creating more poop for you to clean up in the process. Grains can also cause your dog a lot of health problems. 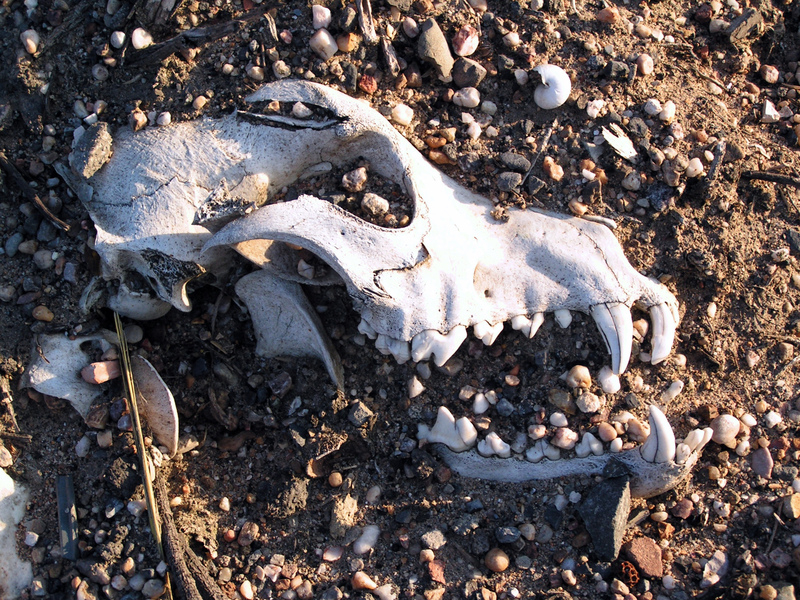 Canines are mainly carnivores. Their jaw structure has evolved to help them process the game they bring down. Their teeth were designed for ripping, slicing and tearing, not chewing. While dogs have come a long way down the evolutionary chain from wolves, their digestive system is still 98% identical to that of the grey wolf. 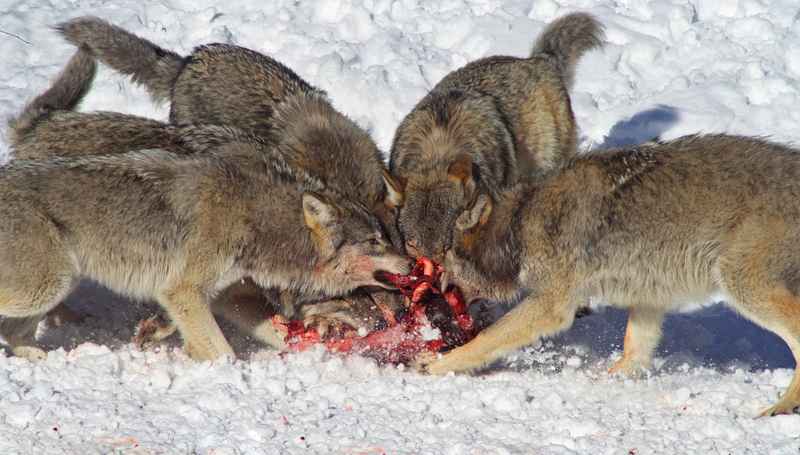 To me it seems only logical that they should then at least in a sense mimic the grey wolf’s diet. And in the wild, I doubt you would find a wolf eating kibble for every meal. Part of the satisfaction of feeding RAW, at least for me is knowing that I am feeding my dog something she was designed to eat. I also like knowing what is in my dog’s food, quality of ingredients, etc. Also, just as I wouldn’t want to eat the same meal day in and day out my dog is fed something that excites her olfactory system. 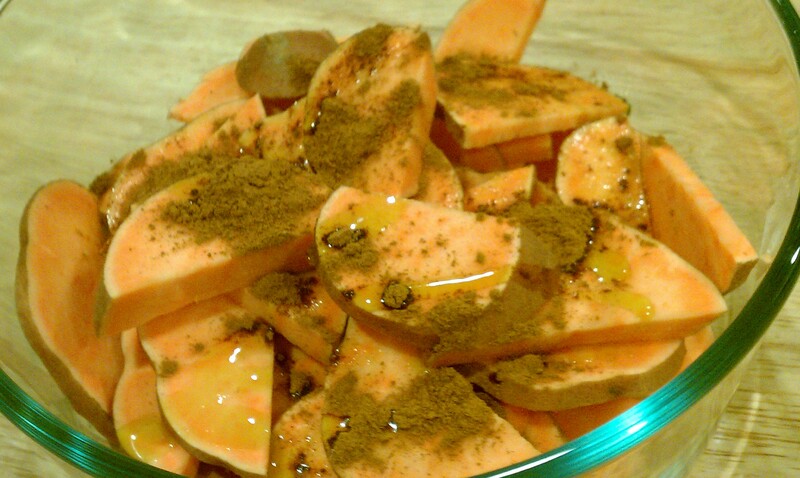 The different textures, smells, and flavors are exciting for a dog. 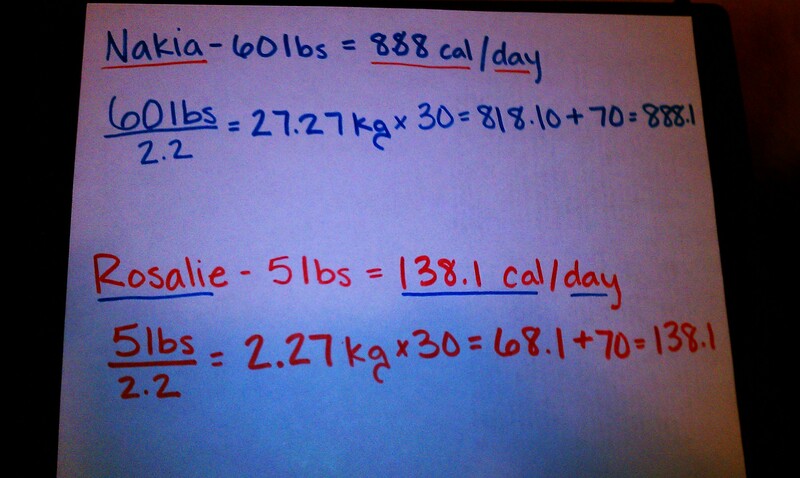 I no longer have any problem at all getting Nakia to stay at a healthy weight. RAW basically means giving them the food just the way it is. Mainly you just need to portion out the meat, no cooking necessary. For small dogs like Rose I will chop up the meat into small pieces so she doesn’t choke. Otherwise she would woof down even the big pieces. I have seen her try to take down a whole chicken drumstick like she is a seagull eating a fish. I know of RAW people who feed their dogs full chicken and rabbit carcasses but I have not yet reached this step…and I don’t think it would work for Rose. I’m sure Nakia would think it was the greatest day of her life if I did it for her though. 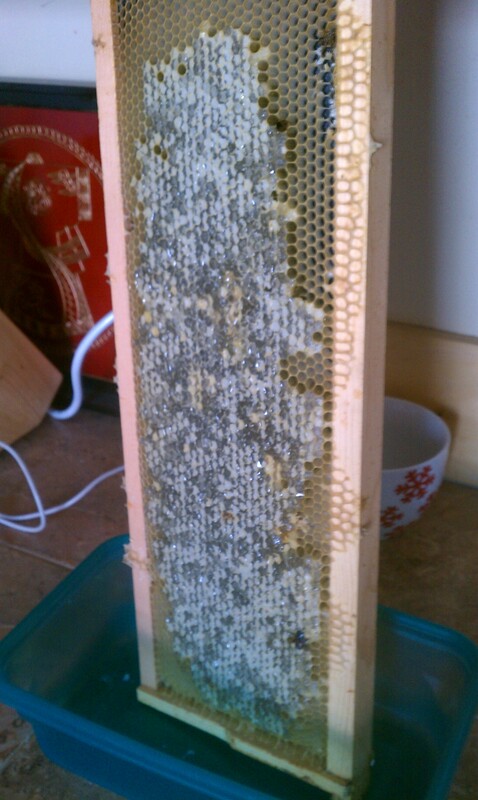 When I introduced RAW feeding into Nakia’s diet all of her allergies went away. She no longer has the gunky eyes, pimply stomach or itchy skin that plagued her life in the past. I also have absolutely no problem getting her to eat her meals. 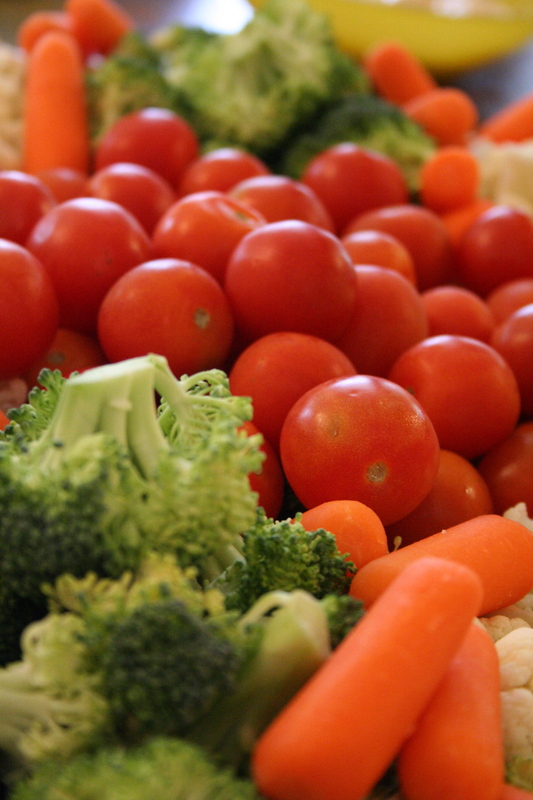 So what are the health benefits of feeding your dog a RAW diet? These are only some of the benefits I have noticed in dogs who are fed a RAW diet. 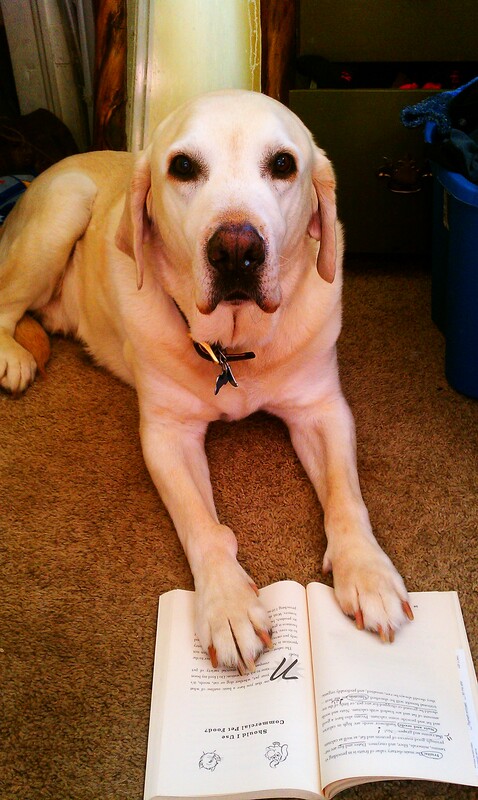 The key to feeding your dog a healthy and balanced diet is RESEARCH! Don’t be afraid to get out there and do some of your own!